PITTSBURGH, PA--(Marketwired - December 07, 2016) - Petrosoft introduces the next generation of its cloud solutions, Petrosoft Cloud. With the company's growth in products, services, and integrated solutions, Petrosoft Cloud amplifies and bridges the services delivered within this unified cloud solution. It is the backbone of the company's cloud-based and cloud-connected services. It provides a secure infrastructure and support while also saving time with seamless navigation between cloud-based and -connected loss prevention analytics, POS, foodservice, fuel management, inventory management, back-office, and data exchange solutions. Petrosoft Cloud provides a scalable solution and the interoperability needed to compete in today's retail ecosystem. "Petrosoft Cloud is the culmination and a natural progression of our cloud development and integration over the past 15 years," said Sergey Gorlov, CEO of Petrosoft. "It saves time and reduces risk while also providing a flexible and scalable platform to meet the demands of today's and tomorrow's retail ecosystems." Over the past 15 years, Petrosoft has grown its cloud offering from its back-office solution, C-Store Office, to many cloud-based and -connected solutions to meet industry, economic, and regulatory changes. Currently, Petrosoft hosts, backs up, and manages the data for thousands of retail locations, safeguarding and distributing data as required by Petrosoft's customers. Because of this technology, subscribers can conveniently access, enter, and manage information to make critical day-to-day operational decisions from anywhere in the world. The only requirement is an internet-connected device. Find out more about Petrosoft Cloud and its solutions at PetrosoftInc.com/join-the-ecosystem. The company's technology is positioned to deliver a measurable return (ROI) to retailers since it is focused on where sales and profits are realized, within day-to-day operations. The company continually strives to create innovative solutions, enabling retail operators to manage their on-site and back-office operations more efficiently. Retailers can use these solutions to decrease risk, leverage legacy data and systems, and to optimize inventory, productivity, sales, profits, and margins. From its headquarters in Pittsburgh, the company supports its POS, foodservice, fuel management, and back-office product lines as well as its integration with industry-leading technology partners. The company offers a full menu of services along with flexible training options such as on-site, classroom, online, and on-demand sessions. Find out more at PetrosoftInc.com. Graphic representation of Petrosoft Cloud. It is the backbone of the company's cloud-based and cloud-connected services. 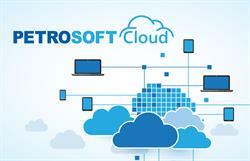 Petrosoft introduces the next generation of its cloud solutions, Petrosoft Cloud.